Driving the occasional basic boat is good for the soul. It makes you realize that bigger and more expensive is not necessarily going to make a proportional improvement in your pleasure. The FunYak 12 with a six horsepower two-stroke on the back would definitely fit most people’s idea of basic, and I loved it. FunYak is one of those European companies no one local has ever heard of that mass produces thousands of boats each year. Quite a restricted range too: between 2.4 and 5.5 metres, all of them accepted for commercial service in the European Union. 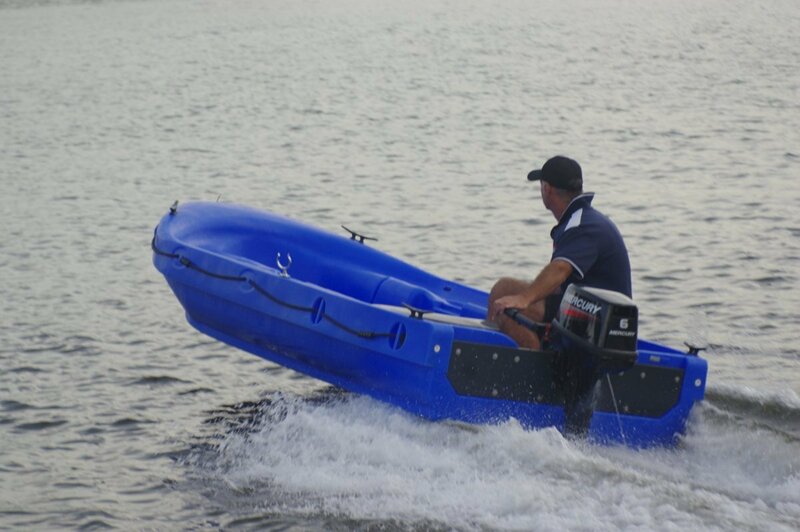 The review boat, the 5.5 metre FunYak 12 is probably the most popular model. As an aside, it is curious that the French who invented the metric system typically use feet for boat lengths. Like all the family the 12 is in double skinned polyethylene, foam filled: as near unsinkable as it gets and as near maintenance free. The simplicity theme extends to the built in propulsion system: a pair of rowlocks (purists call them crutches), in stainless steel, no less. For stealthy brackish water fishing nothing beats oars, although it takes some practice to row silently. I quickly felt the old cunning come back and thoroughly enjoyed myself, making good progress with minimum effort. Oar propulsion is not just for show: buyers have bought motorless Yaks for use on farm dams and for bird watching on the Serpentine lakes among other occupations. Oars would make sense for a tender used solely for mooring to Rottnest beaches – or to keep juniors amused. Poly is soft and slippery so makes sense for a tender. The performance under power astonished me. Six horsepower took me up to around 20 knots. Motors up to 20hp are acceptable, but only thrill seekers need apply. The two-stroke option will not be around for long as Mercury is no longer importing them. It seems a pity. Down at this power level the light weight, simplicity and lower cost are assets that, for many owners, more than compensate for higher fuel consumption, noise and smell. Not that the last two were intrusive on the day. 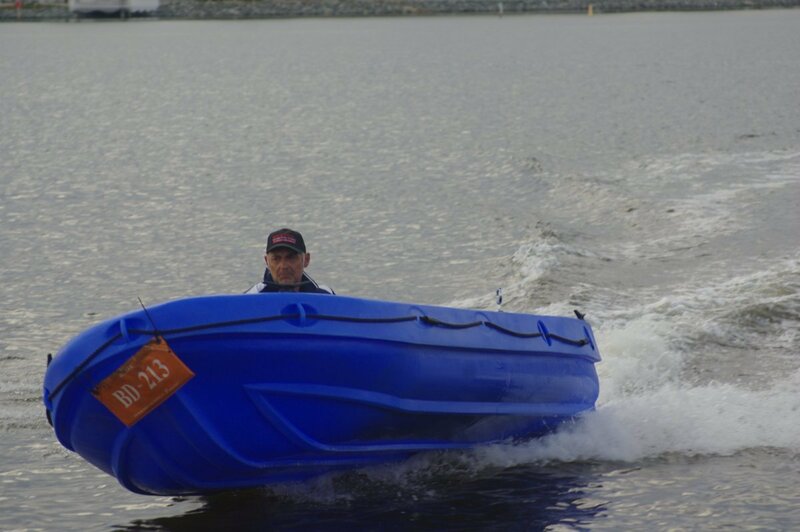 Where many small poly boats have hull forms resembling inflatables, the Yaks are shaped like traditional dinghies. The 12’s interior has foam filled fore and aft benches down each side and sockets to take a box thwart. 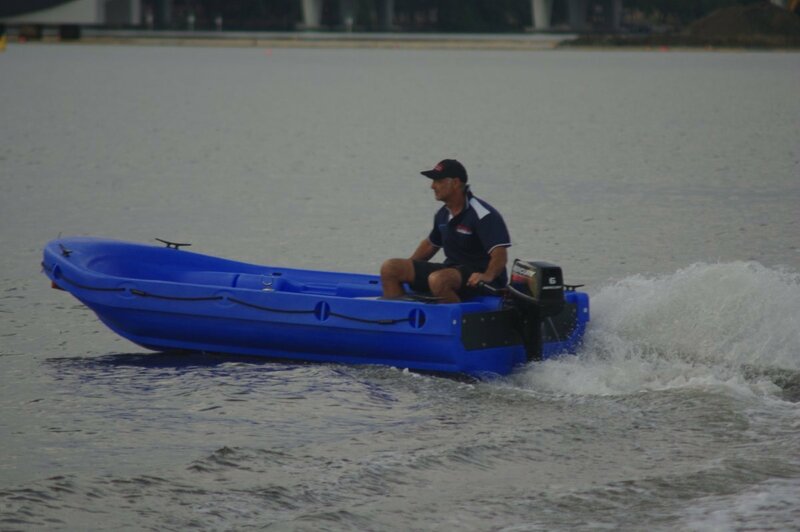 There are two sets of these; midships for rowing and aft for driving. There is not a lot else in the boat apart from a hefty cleat at each corner. Outside the boat are beckets, inflatable style. 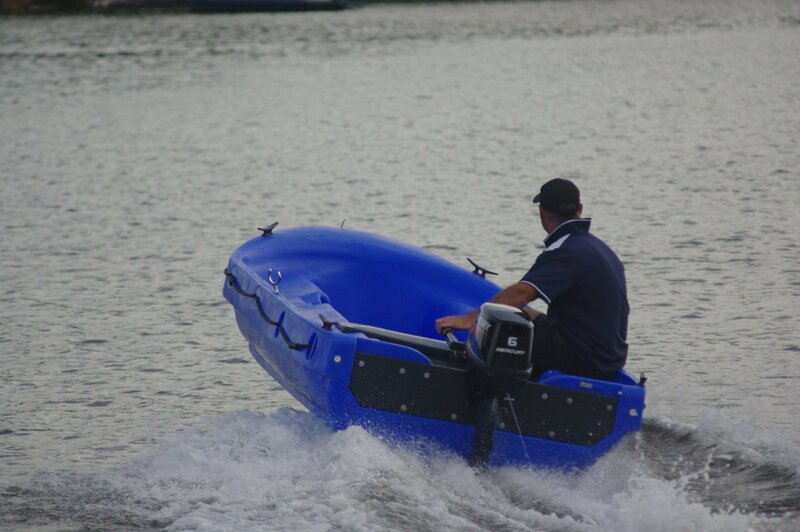 The review boat came on a trailer, but with a hull weight of just 100kg two adults could load it on a box trailer or a tray back ute. If the distance from storage to water is short, some models are available with built-in wheels to remove the lifting need.